I’ll go into the construction of this in more detail on the web site so here I’ll just mention a few of my thoughts about it. Well we want to indicate that the woods are private. It’ll not stop people getting in but hopefully they might think twice before coming in and disturbing anything. We are thinking carefully about the wildlife and habitats, and hope any visitors invited or univited will do the same. We also have a responsibility for maintaining a stockproof fence along that boundary. The current owner of the adjoining field however doesn’t have current plans for keeping stock in there so I feel I can take my time over resurrecting the fence. 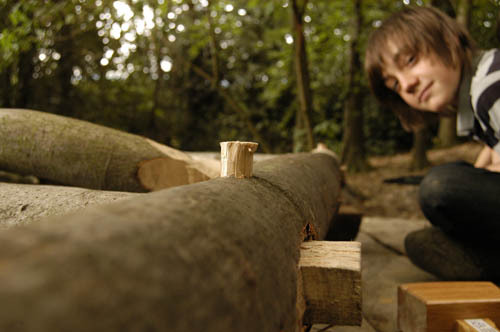 Green Woodworking is all about using timber fresh from the tree, unseasoned. I’ve reading about it as a child and been fasinated by what can made using simple hand tools ever since. Building the gate has been my first real forray into building up these skills. Being self taught and experimenting I can’t claim that the gate is perfectly traditional. I know that using cleft timber is more common, however I’ve not got a froe yet. So that particular skill will to wait, it’s on the list. 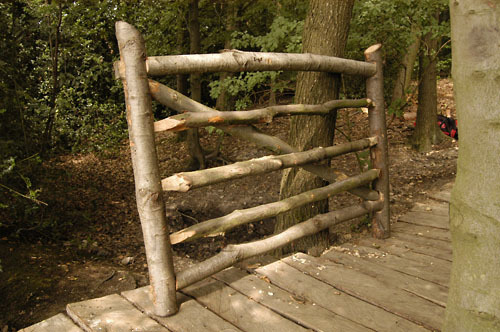 So it’s might not be totally traditional but my goal was to make a gate in the woods from the woods, stick to principle of not bringing to the wood anything that isn’t necessary. 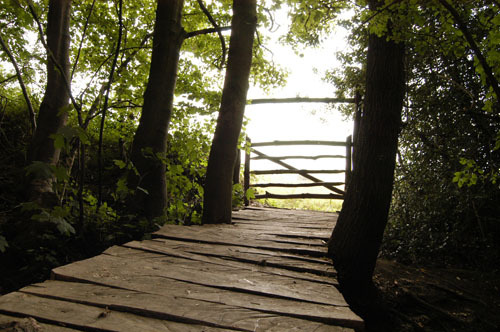 The gate itself has no screws, bolts or nails holding it together, just four pegged mortice and tenon joints. It’s now ready for hanging and I will cheat at this point as I’ve not figured out how to make wooden hinges. I might also leave it a bit to dry out, at the moment it is very heavy and might put a bit too much stress on the gate posts. This entry was posted on Tuesday, July 26th, 2011 at 11:54 am	and is filed under I do Woodland Stuff. You can follow any responses to this entry through the RSS 2.0 feed. You can leave a response, or trackback from your own site.